Of course it's Mario Kart time. She's always ready, at a moment's notice, to pick up her controller and pilot her way to the finish line. She's pretty much an outright Mario Kart prodigy. How does she always win? Maybe its because she has an all-time top favorite character. Her real favorite. You know, she almost always drives as Princess Peach! Well, we'd like to introduce a new way to have her kart around the track. She doesn't need a controller or to even take the time to pick out an character. Really, she doesn't even need to turn on the Nintendo! Because, this time, she's going to be the driver, and she's going to be Princess Peach! 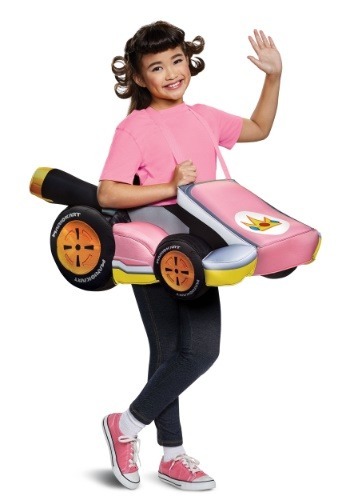 When she has this kids Super Mario Kart Princess Peach ride-in costume, she'll be ready to roll. With details straight from the hit video game franchise, this costume is perfect for Halloween fun. We just hope she's ready for the Winner's Circle! This Princess Peach ride-in costume for girls is Nintendo officially licensed, and tons of fun to wear! 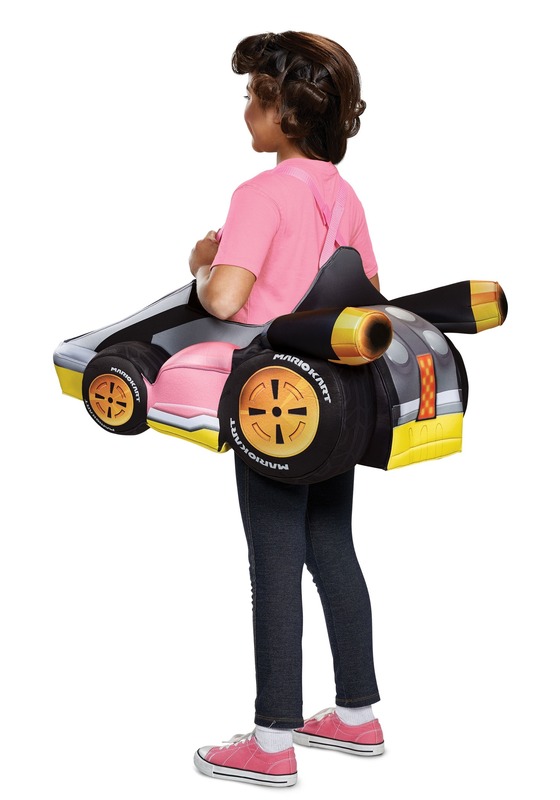 A polyfoam “kart” is attached to suspenders, and it fits over the head to create the illusion of the wearer being the kart driver. Printed details and graphics provide the finishing touches with the crown logo on the hood and Mario Kart branded tires. She'll be winning the costume game when she chooses to race towards the finish line in this Mario Kart costume. Combine this with a Princess Peach costume for added effect, or just have her wear a pink t-shirt, and she'll have a simple costume style for a ton of video game fun!